Boswellia is a genus of trees in the order Sapindales, known for their fragrant resin. The biblical incense frankincense was an extract from the resin of the tree Boswellia sacra, and is now produced also from B. frereana. The four main species of Boswellia, B. sacra (synonyms B. carteri and B. bhaw-dajiana), B. frereana, B. papyrifera, and B. serrata, produce true frankincense, and each type of resin is available in various grades. The grades depend on the time of harvesting, and the resin is hand sorted for quality. Boswellia species are moderate-sized flowering plants, including both trees and shrubs, and are native to tropical regions of Africa and Asia. The distributions of the species are primarily associated with the tropics. The greatest diversity of species presently is in Africa and India. The plants are dioecious. The flowers may have four or five faintly connate but imbricate sepals with an equal number of distinct, imbricate petals. Also, the stamens, that may contain nectar discs, have distinct glabrous filaments that occur in one or two whorls and in numbers equaling or twice the number of petals; the tricolporate pollen is contained within two locules of the anthers that open longitudinally along slits. The gynoecium contains three to five connate carpels, one style, and one stigma that is head-like to lobed. Each locule of the superior ovary has two ovules with axile placentation that are anatropous to campylotropous. The one- to five-pitted fruit is a drupe that opens at maturity. The endosperm is usually lacking in the embryo. ^ The genus Boswellia, and the type Boswellia serrata, were first described and published in Asiatic Researches 9: 379. 1807. "Name - Boswellia Roxb. ex Colebr.". Tropicos. Saint Louis, Missouri: Missouri Botanical Garden. Retrieved November 24, 2012. Type Specimens: T: Boswellia serrata Roxb. ex Colebr. ^ a b Tucker, A. (1986). "Frankincense and myrrh". Economic Botany. 40 (4): 425–433. doi:10.1007/bf02859654. 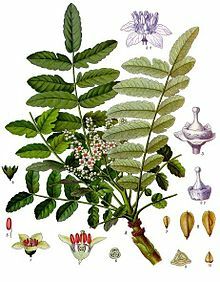 ^ a b "TPL, treatment of Boswellia". The Plant List; Version 1.1. (published on the internet). Royal Botanic Gardens, Kew and Missouri Botanical Garden. 2013. Retrieved September 24, 2014. ^ a b Weeks, A., Daly, D.C. and B.B. Simpson. 2005. The phylogenetic history and biogeography of the frankincense and myrrh family (Burseraceae) based on nuclear and chloroplast sequence data. Molecular Phylogenetics and Evolution, 35: 85-101. ^ a b c d e f g Judd, W.S., Campbell, C.S., Kellogg, E.A., Stevens, P.F., and M.J. Donoghue. 2008. Plant Systematics: A Phylogenetic Approach 3rd ed. Sinauer Associates, Inc., Sunderland, Massachusetts, USA. This page was last edited on 21 February 2019, at 04:06 (UTC).